Menu features award-winning pies and sausages. Food served all day Saturday and Sunday. Richmond and Hounslow CAMRA pub of the year 2007. 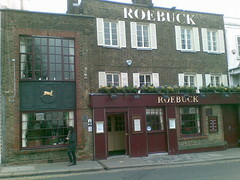 According to Richmond and Hounslow CAMRA, it was refurbished in February 2012 and now has nine handpumps. Bob visited on a Thursday afternoon in February 2008. Beers available were Tempus Fugit (£2.85), Moorhouse Pride of Pendle (£2.85), Skinners Best (£2.74), and London Pride. Mixed grill was £11.40 and was very good. The steak was rare. They seem to stop serving food at 3pm on weekdays. Last visited by Bob, 28 February 2008. Last edited 2018-11-10 14:19:38 (version 26; diff). List all versions. Page last edited 2018-11-10 14:19:38 (version 26).